South and Central America received a good deal of attention from naturalists in the latter half of the 19th century. Philip Lutley Sclater [1829-1913] was appointed secretary of the Zoological Society in London in 1859 and became world famous as an expert on neotropical speciation and zoogeography. Sclater used his personal collection of skins of American birds to prepare his Exotic ornithology, containing figures and descriptions of new or rare species of American birds. Issued in fifteen parts from 1866 to 1869, Exotic ornithology contained an excellent scholarly text by Sclater and Osbert Salvin [1835-1898] with one hundred hand-colored lithographs of neotropical birds by Joseph Smit [1836-1929]. A handsome copy of the large-paper edition of this work, one of only fifteen issued in this format, graces the Hill Collection. 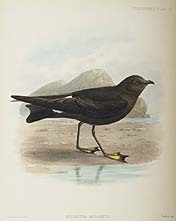 Philip Sclater was also responsible for preparing the "Birds" section (1881) of the Zoology volumes of the Report on the scientific results of the voyage of HMS Challenger. The entire set of reports on the Challenger expedition to the South Seas is part of the History of Science Collections. Another useful title of Sclater's in the Hill Collection is A monograph of the birds forming the tanagrine genus Calliste (1859). The fine colored plates depict all the known species of tanagers in the genus. Osbert Salvin, who aided Sclater in writing Exotic ornithology, edited with Frederick Du Cane Godman [1834-1919] a series of works on the fauna and flora of Mexico and Central America entitled Biologia centrali-americana. The section on birds, called Aves, was issued variously in three or four volumes and contained eighty-four hand-colored plates of excellent quality. The Hill Collection copy is the three-volume edition with plates interspersed throughout the text. Among material in the Hill Collection focusing on British birds are two multi-volume sets by Francis O. Morris: A natural history of the nests and eggs of British birds (1856-1867) and A history of British birds (1866-1868). A beautiful set of Henry E. Dresser's famous nine-volume A history of the birds of Europe (1871-1896) is a prime possession.